Even feeling under the weather and in warm and wet weather far from ideal for ski racing, EagleVail’s Mikaela Shiffrin is a powerhouse on skis. The 22 year old won the sixth giant slalom race and 39th World Cup race of her stellar career on Saturday in Kranjska Gora, Slovenia, battling a cold and iffy course conditions. The races were moved from Maribor, Croatia, due to a lack of snow and warm weather. KRANJSKA GORA, Slovenia (Jan. 6, 2018) – World Cup victory No. 39 wasn’t an easy one for Mikaela Shiffrin. Feeling a bit under the weather and racing through light rain on a rough, straight-set course, Shiffrin (Eagle-Vail, Colo.) took the first run lead and held on to win her eighth FIS Ski World Cup race this season. Tessa Worley of France was second, and Sofia Goggia of Italy picked up her fourth World Cup podium of the season in third. With the victory, Shiffrin moved back into the FIS Ski World Cup overall giant slalom standings. Germany’s Viktoria Rebensburg held a narrow advantage over Shiffrin in the overall standings heading into Saturday’s race, but she faltered in the challenging conditions, and finished 11th, falling to third in the GS standings. Shiffrin, who has totaled 1,181 World Cup points so far this season, now leads the overall World Cup standings by 647 points over Rebensburg. Shiffrin also leads the overall downhill and slalom World Cup standings. 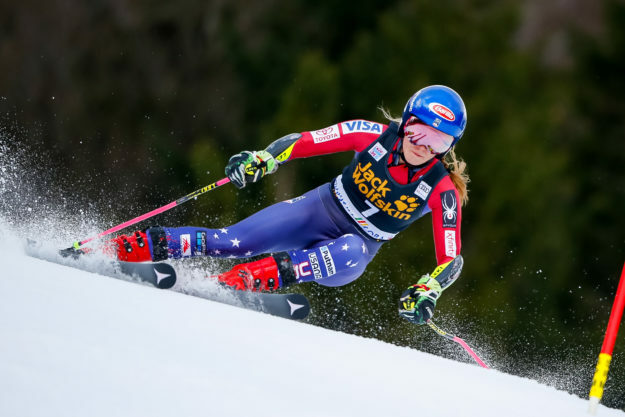 Starting fourth in the first run, Shiffrin built a 0.86-second lead – the largest first run giant slalom lead of her career – and challenged the rough second run head-on. Saturday’s race was scheduled for Maribor, Slovenia, but was moved to Kranjska Gora due to snow conditions. It was the first time the women have raced in Kranjska Gora since 2012. Seventeen-year-old AJ Hurt made her third World Cup start, finishing 45th in the first run. Foreste Peterson, who skis for Dartmouth College, also made her second World Cup start, finishing 53rd in the first run. Up next, the women race slalom Sunday in Kranjska Gora.